Our tour of the ancient wonders now zips across the Mediterranean Sea to Alexandria Egypt. Statue of Ptolemy from the Pharos entrance gate. 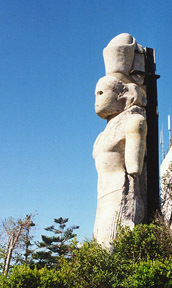 Underwater archaeologist raise a statue from the Alexandria bay. 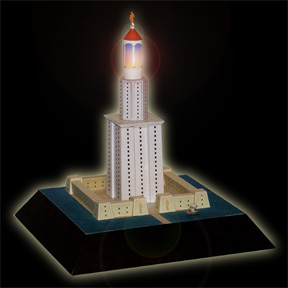 This was a souvenir model sold to tourist at the lighthouse. 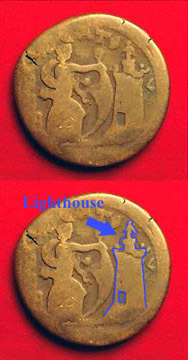 An ancient coin showing the lighthouse. It was a monument, a tourist attraction, a brilliant business venture and a wonder of the ancient world. In many languages “Pharos” is still the word for lighthouse. The tiny island of Pharos was chosen by Ptolemy Soter around 290 BC to construct the great tower that would guide ships safely into the harbor of Alexandria (his capitol).It took twenty years to build and by the time it was completed Ptolemy Soter had died and been succeeded by Ptolemy Philadelphus The architect was Sostratus, a contemporary of Euclid. One of the many legends surrounding the Pharos says that Sostratus wanted to have his name engraved on the monument but Ptolemy (which one?) said his name and only his was to be engraved upon it’s base. Sostratus got the last laugh by engraving his own name then covering it with plaster and engraving Ptolemy’s name over it. Long after the death of both men the plaster chipped away as Sostratus knew it would leaving his name for history. The lighthouse itself was either constructed of or covered with white marble. The tallest building of its time (except for the great pyramid) it was the equivalent of a modern 40 story building standing 384 ft (117m). It allowed visitors views that they could not get anywhere else in the ancient world from two observation levels. Tourists bought food and souvenirs while looking out across the Mediterranean Sea from up to 243 feet in the air. The true work of the lighthouse was accomplished by a giant polished metal mirror that could reflect the sun out to sea. At night a fire would illuminate the tower’s beacon which must have been left burning during the day as well because sailors report being able to see the smoke up to 100 miles out at sea. The mirror became the subject of many more legends as time went by. Some said that the mirror could be turned on enemy ships to burn them or even used to view the far off rival city of Constantinople. These legends while entirely impossible could have been of great advantage to the people of Alexandria. After all, who would attack a city with such an advantage? The end of the lighthouse seems to have come through earthquakes but no doubt also neglect. As time went by the capitol city changed and Alexandria was not the important port it had been. The last thing we know about it’s remains from history is that in AD 1480 the Egyptian Mamelouk Sultan, Qaitbay built a fort on the same spot where the Lighthouse once stood, using the fallen stone and marble. It was the last of the vanished wonders to disappear. Today there are plans to make the bay at Alexandria an underwater archaeological preserve. 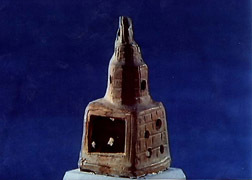 Large stone blocks have been found as well as statuary all believed to have once been pieces of the original Pharos lighthouse. The giant statue of Ptolemy believed to have stood at the Pharos gate has been recovered and now stands outside the new Library of Alexandria. This model is slightly more complex than the past wonders. It is in 1/877 scale. To download the model right click below and select "save target as"
This model is presented as an ADOBE ACROBAT file. If you need an free acrobat reader go here. If you have never built a paper model before we recommend you print it out at your printers highest quality setting onto card stock. After cutting it out you can use white glue or "tacky" glue to assemble it.